Recently I was working on an integration scenario which I thought demonstrates some of the modern integration technology advantages which simplify the scenario of bringing the user into the process. If we consider the following example which I have discussed before we have a system of record implemented in an instance of Dynamics CRM which we have used for a few years and we wanted to compliment it with a single use case but we want to use a system of engagement to extend the scenario with a Microsoft Power App. The Power App will capture data in a simple set of forms and when this data is captured a Logic App will synchronise the transaction to CRM and kick off a bunch of background processes to process the records. The below picture illustrates this. Once we have the data entry app running we do need some reference data to make the user exeperience nicer. 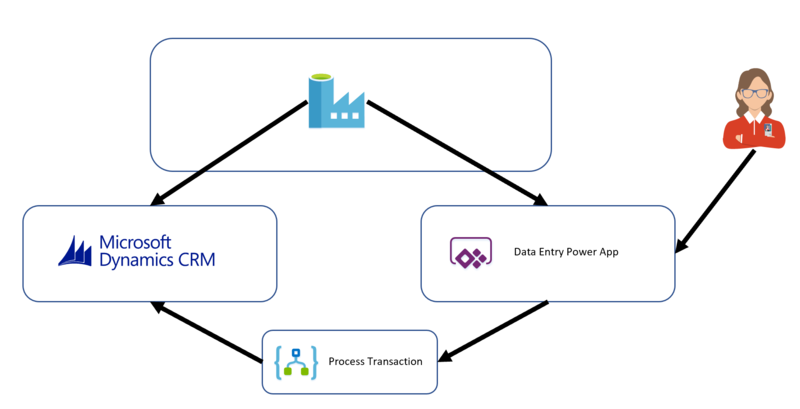 To synchronize some reference data between the CRM instance and the Power App we choose to use Azure Data Factory to implement a simple synchronization process like in the below diagram. We were able to schedule this to run on a regular basis to sync things like a list of countries and partner companies. The one problem we found was that sometimes the business users would add a bulk of new partners to CRM and the nightly delay was a bit of a pain for the data being slightly out of sync. It wasnt a massive problem but we looked into some options to do something about it. The next step was to create a way to allow the business user to trigger the sync process on demand if they have made a lot of changes to the data. To achieve this I created a Logic App next to my Data Factory which would be able to be triggered over HTTP which would then be able to make the Data Factory Pipeline run. 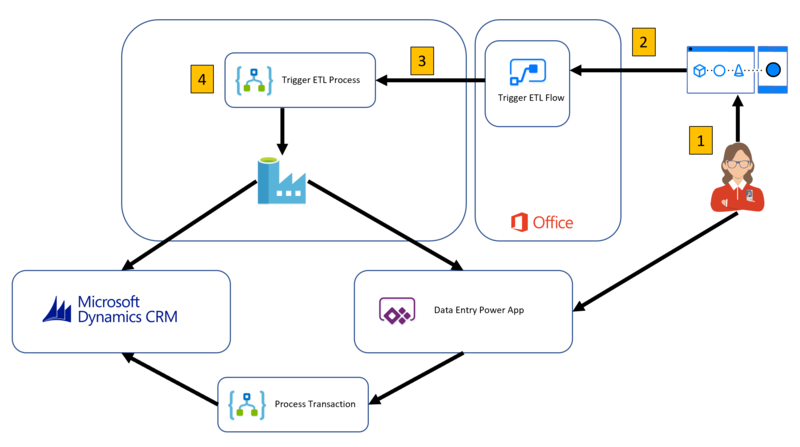 I then used a Microsoft Flow with the input trigger of a Flow Button press which would trigger the flow and it would then call the Logic App which would then trigger the Data Factory. The below picture shows this representation. I was able to add the user to the team which my Flow belongs to and then the user is able to trigger the Flow easily from the Flow Mobile app. There are a few interesting design considerations in this process.